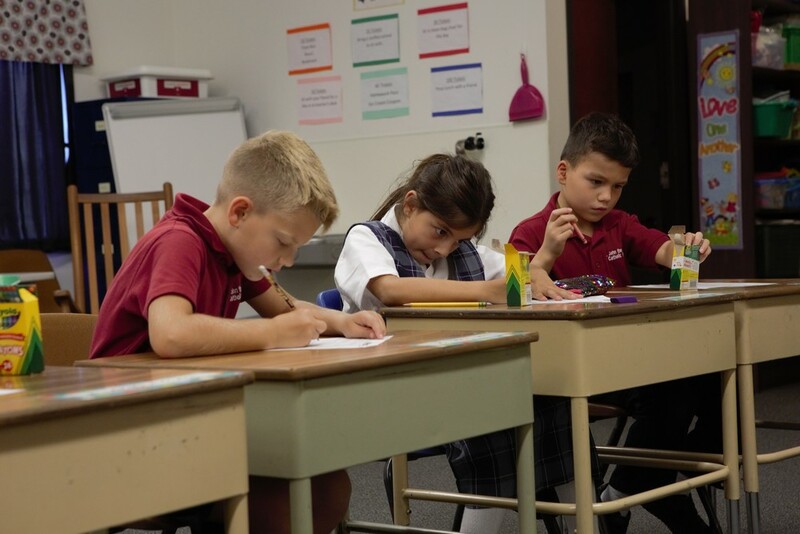 Religion is taught daily and gives our students the opportunity to grow formally, spiritually, prayerfully, and liturgically. Each grade takes an active part in preparing and leading a weekly mass. Each grade emphasizes grammar, vocabulary, and composition skills, especially through the use of 6 Trait Writing. In grades 7 and 8, the skills to complete a research paper are taught. Students in PreK-1st work on proper letter formation in their handwriting. Beginning in second grade, students learn cursive handwriting and all students in grades 3-8 are required to use cursive handwriting in their work. Reading in the early grades incorporates a structured program of phonics in addition to reading. Students at all grade levels enjoy additional reading. Classical and contemporary literature are stressed in grades 6-8. Junior Great Books is taught in grades 3-7. Fundamental skills, problem solving, logic, and accuracy in computation are stressed in our math curriculum. Students in grade 7 who qualify may take Pre-Algebra and proceed with Algebra in grade 8 for high school credit. Scientific skills and topics are presented through a hands-on approach. Students in grades 6-8 learn in a lab environment, and block scheduling allows time for experiments and discovery activities. Students learn about our world, our country, and our community. Students in grades 4 and 7 focus on Texas History and in grade 8 on American History. Geography and Civics are taught in-depth to students in grades 6-8. All students have specialized teachers for art, computer, music, physical education, and Spanish.